A view of theater in Richmond, VA, and occasionally other places too. On two occasions recently, I’ve found myself in the company of people who don’t like musicals. Rather than treat them like traitors against the realm or shrink in horror at their inhumanity, I’ve engaged in a bit of conversation with them, not unlike what Sarah Silverman has been doing in her new show. Through those talks, I gained some understanding of that anti-musical perspective and I like to think that Murder Ballad would be the rare musical that would appeal to even sung-through haters in the world. 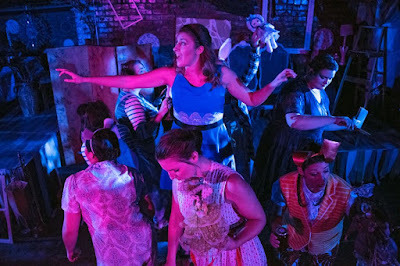 The show’s immersive staging at Club Infuzion in Scott’s Addition means you can practically reach out and touch a performer at multiple points during the show. It moves fast, it’s plot is simple and straightforward, and it features consistently propulsive music (thanks to Kim Fox and her very peppy band). Director Lucian Restivo has cast a rock-solid group of actors who nail every beat of the love-triangle-gone-deadly story. As someone who tries to sit in the front row for most shows, I was in heaven. The production layout has four principal focal points: an elevated mainstage where the band plays, a house-left bar, a house-right pool table that becomes a bed, and another elevated area near the back of the house. I was happily spinning in my seat to adjust my sightlines from one to the other throughout the compact, intermissionless 90-minute performance, my favorite moments being when one of the cast members was singing just inches away from my table. And what a cast! 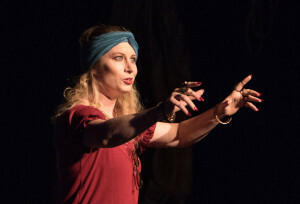 Rachel Rose Gilmour has been the highlight of two other of my recent favorite theater experiences (Toxic Avenger and Lysistrata) and she brings a delightful, delicious, darkly sarcastic slinkiness to “Ballad’s” narrator. She inserts regular commentary on the growing rivalry between Tom (Durron Tyre) and Michael (Chris Hester) for the affection of Sara (Katrinah Carol Lewis). Tom, a bar owner, has affection with a fiery lustful underbelly that eventually clashes with Michael’s, a poet/MBA who is raising a child with Sara and so operates from a more possessive, papa-bear place. There’s no doubt things are going to end badly but exactly how isn’t clear until the very end. With the brevity of a musical like this, some nuance can be lost and it’s up to Hester and Lewis to provide enough layers of personality to make Michael and Sara an interesting couple. Both do a fine job, Lewis creating a believably disaffected wife and mother, loving her family but craving her former wild life. The energy of her “I don’t want to know your name” hook-up with Hester persists throughout her domestic scenes. Hester has to do more with less but, particularly given some of the extravagant characters he’s played in the past, captures some pretty delicate gradations: projecting a sweet protectiveness in his early scenes, transitioning to a wound-tight buttoned-down peevishness, and ending with full-bore boiling over. It may be the hunky Tyre, though, that rivets many a viewer. He has one of the first musical highlights of the show in his sweet rendition of “Sara” and, besides rocking an awesome leather jacket in the latter scenes (costumes by Sheila Russ), he has a single-minded intensity throughout that’s pretty entrancing. Kudos must be given to Restivo for navigating a tricky staging challenge and delivering such a stylish thriller. I may be wrong: being immersed in a musical could be some people’s worst nightmare. But there are so many entrees to Murder Ballad, it has appeal for anyone with an affection for film noir or for messy love stories or thrillers or in-your-face drama or for good-looking actors with great voices or for any theatrical experience that’s different than most others. Doesn’t that cover just about everyone? I’ve attended multiple performances of a production many times in the past. 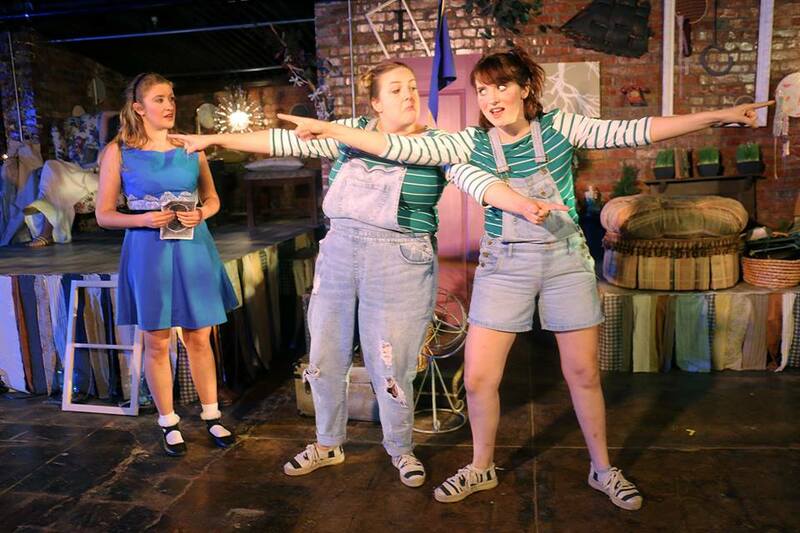 When the now-defunct Stage 1 did Children’s Letters to God, I saw every single one of the show’s 8 or 9 performances. I was at the theater mostly for logistical reasons but nothing was compelling me to watch the show every time. I chose to watch it every time because it was an awesome production. In other cases, a show like VA Rep’s The Color Purple has compelled me to take different groups of friends to it as proof of the quality of Richmond theater. 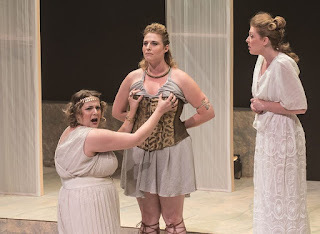 For Quill’s Lysistrata, starring Grey Garrett, I saw the show three times mostly for business reasons. My new venture, Behind-the-Scenes RVA, dovetails perfectly with Quill’s mission: they seek to produce theatre worth talking about and one of my goals with BTS-RVA is to provide context that can inform those conversations. There are some comedic powerhouses in this cast. Jeff Clevenger and Maggie Bavolack, in particular, are so talented that they can generate laughs with a look or a line delivery. After the first viewing, theirs were the performances I remembered. But after repeated viewings, I gained appreciation for CJ Bergin as the Spartan herald who had several very choice bits and absolutely nailed them every single time. I also grew to love the playful dynamics between Michael Hawke and Melissa Johnston Price and the small comic moments they capitalized on, Michael getting a hearty laugh by dangling his feet like a toddler and Melissa’s sarcasm after removing “the mother of all gnats” from Michael’s eye. Certainly, a good chunk of credit must be given to director James Ricks for locating these moments and elevating them, but the execution was also exceptional. In part because they are obscured behind masks, it’s easy to overlook the work of the chorus of old women who seize control of the Acropolis. Some choice lines are delivered by Katherine Wright, Addie Barnhart and especially Amanda Durst with her rambling fig rant. I’m sure epic poems could be written about the beauty, both unclothed and clothed, of Terrie Elam as Ismenia/Peace. 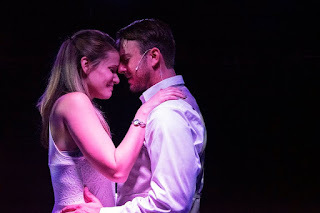 But it is also her sweet clear voice that lends another layer of pathos to the show’s final scene, rising up a cappella as the gravity of what has happened sinks in. 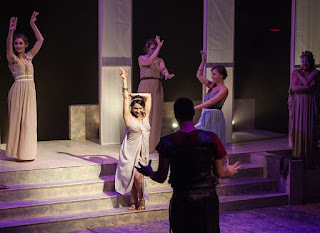 And while on the subject of the beauty of the cast, it’s worth mentioning that, in Lysistrata, Rachel Rose Gilmour bolsters the significant cred she earned through a stellar performance in The Toxic Avenger as much more than just a pretty face. She shows exceptional comic chops in her teasing of a delightfully confounded Adrian Grantz; she’s one of many reasons I’m looking forward to 5th Wall’s Murder Ballad. 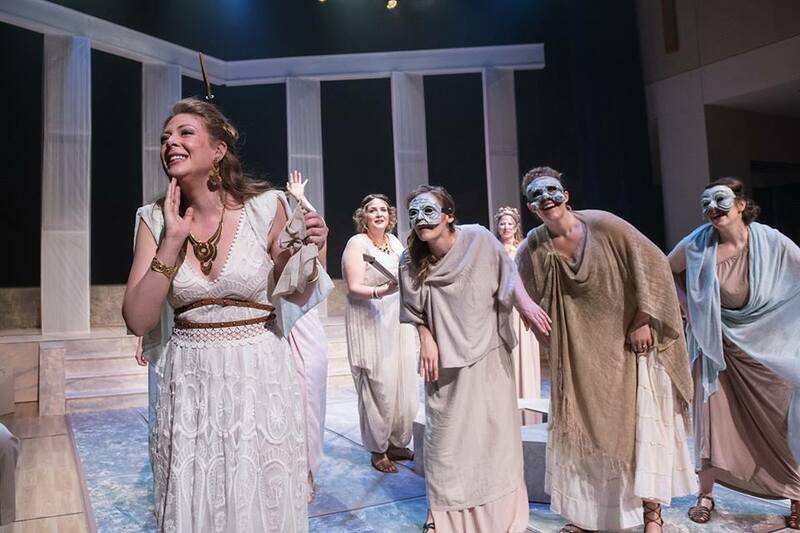 Having seen Grey Garrett in a range of excellent roles, at first I came away from Lysistrata disappointed about her part. As I described in the Curtain Call podcast, she’s kind of the scold of the piece, forced to repeatedly browbeat her team into staying in line. It was only through repeated viewing that I saw more of the subtlety of her performance, her very fun teasing of Kinesias as her approaches the Acropolis, her look of anticipatory victory right before she brings Peace out to the inflamed negotiators. I still have liked her better in her restrained mania in The Wild Party or as the unexpectedly empathetic White Queen in Alice. But she still manages to shine in this less meaty role. Ah, the ending. While at first I was conflicted by the ending, I’ve grown to really appreciate it. Out of the numerous choices James Ricks had in wrapping up what is usually kind of a “meh” ending to the story, he took a bold choice, a somewhat unsettling choice, but one that puts a succinct button on the underlying issues addressed in the show. 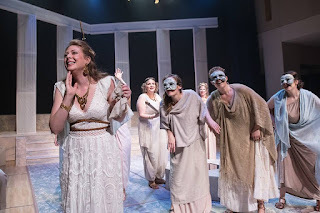 I’m sure it is somehow inconsistent with different conventions – either of traditional Greek comedy or arguably of modern “sitcom” comedy – but for me, it makes me leave the show with more to chew on rather than just walk away blithely satisfied at being well entertained. There are issues of feminism and sexism that have been talked about rather openly thanks to the Style review and the response James wrote to it so I’m not going to circle back on them now. These issues were debated quite rigorously among people who came to the Behind-the-Scenes tours. And that kind of conversation is pretty awesome, I think, and just goes to show that this was indeed theatre worth talking about. By the way, if you’re reading this, please tell your friends and family (and strangers on the street) about future Behind-the-Scenes opportunities; there’s one coming up for RTP’s Cloud 9 this Friday and Firehouse’s Desire Under the Elms the first week in November. More talking about theater will hopefully get more people to get out of their houses and attending live theater. That’s a win for us all! The accompaniment for many musicals in Richmond – and I expect most other mid-market cities – is often electronic. Musicians need to be paid and arranged and rehearsed and such, which can be expensive, so many shows are tracked. It’s easy to think that this doesn’t diminish the impact of the production, particularly if the vocalists are strong. But then you hear the robust, glorious sound of musical director John-Stuart Fauquet’s consummate 6-person crew – 2 cellos and a violin bolstering the piano / guitar / bass trio – and you realize an essential element that is too often missing in other shows. It’s delightful to hear the soar and swell of this chamber group in service of Jason Robert Brown’s complex score. As my wife said afterwards, the music is essentially a character in this emotional two-hander and Fauquet and company bring that character to vibrant, almost symphonic, life. 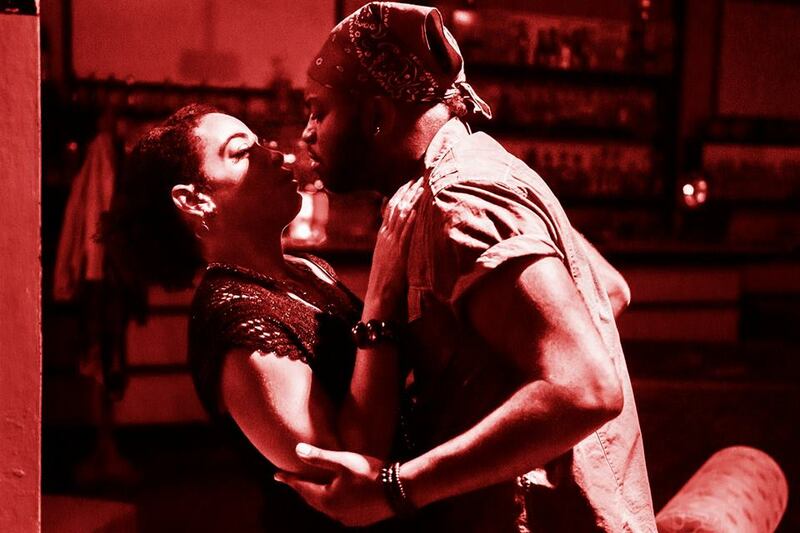 The music perfectly complements performers as powerful as Christie Jackson and Alexander Sapp. Anyone who knows Richmond theater knows these two actors and how incredibly good they are. That director Chelsea Burke wrangled them both for this production was a stroke of genius; as soon as they were announced, this production became one of the most anticipated in town. I don’t believe Style is going to do a review of this production because it already published a fine preview by Rich Griset. I’m not offering a review here and would defer to Mr. Williams at Sifter who gave a review that I (for once) am almost entirely in agreement with, down to his drawing attention to the occasionally glitchy lights. Jerry uses words like “flawless” and “charming” and “superb,” all adjectives I heartily endorse. Alexander Sapp continues to be phenomenal without being annoying. I never lose sight of his humanity; that’s part of what made his portrayals in “Toxic Avenger” and “Croaker” so good, projecting something relatable even when the characters were literally inhuman. That relatability serves him exceptionally well here, as his character responds to his changing fortunes with choices that may not exactly be admirable but are certainly understandable. In his review, Jerry mentions that Jackon’s character has “less versatility and character depth,” which was the basis of a conversation I had during the car ride home after the show. The show is ingenious in many ways but that shortfall is the one nit I would have to pick. I would have appreciated it just that much more if Cathy had been on the cusp of some kind of positive transition at the show’s end or if some additional layers of experience could have been mixed into her story. It’s disappointing principally because Jackson has proved many times she can deliver whatever nuance and depth is required in a role. I loved her in this part but felt like it only exercised 75% of her range and can image how spectacular it would have been if we had gotten closer to 100%. That said, this minor deficit in the musical’s book takes nothing away from the success of this production. This is the kind of production that makes me appreciate the surprising wealth of talent we have in Richmond. From the brilliant musicians offstage to the captivating actors onstage, it’s hard for me to imagine a better staging of this show. 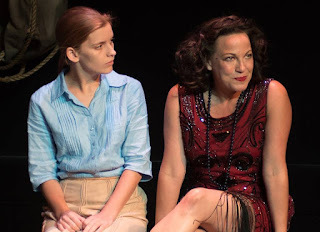 I can’t really add that much to Susie Haubenstock’s review of “Food, Clothing, Shelter," playing only a couple more times at the Firehouse. I agree with essentially every word, including the not-quite-successful aerialist interlude and the call-outs to Keisha Wallace, Kylie Clark and Donna Marie Miller for their great performances. While I agree with Susie’s call-outs, I would save my greatest praise for Rebecca Turner. Her Gloria, the hotel proprietress, seems clearly meant to be what you would call “spectrumy:” she speaks way too honestly and acts awkwardly obtuse in the manner of human interaction. Turner disappears completely into this character, never making her a caricature, projecting a heartbreaking sincerity. The way both Turner’s character and Miller’s – who is indeed fabulous in her role – reveal themselves to each other is a subtle wonder to watch. Bo Wilson’s writing, particularly in that last scene, has to be recognized for its nicely attenuated sense of interpersonal interaction. Each scene in the play involves people who want something running up against others who have to decide whether they want to give anything up. That Bo has formulated three dramatically different variations on that basic power dynamic is a testament to his creativity. My favorite part of the second scene – besides the strong performances – was that the two characters seemed completely genuine to me. Foster’s Izzy was bigger than life but in a way that made complete sense, particularly given the short soliloquy he delivers about the unchanged being fascinated by watching the changed (the most, maybe only, successful one of those interludes). And Wallace’s Bess understands the racial dynamics of the town in a way Izzy never will. The resolution of the scene is a bit broad and doesn’t totally ring true but everything else seemed to me to be just right. 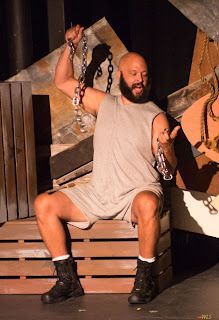 The immersive atmosphere director Joel Bassin creates at the Firehouse for this production draws every patron into what ends up being a communal experience. Maybe it’s because I was there on a Wednesday night with a pretty small house but there was a homey feel to the evening, a looseness where the 4th wall was much more permeable than usual. In the end, “Food, Clothing, Shelter” is an ambitious production about relatively small stories. In some plays, it can seem a waste of time to linger on minor interplay that doesn’t have broader consequences in the world. But Wilson and Bassin have created an engrossing tale where small doesn’t equal inconsequential. In fact, as made plain in the title, such simple interactions often involve the core necessities of life. What could be more important than that? 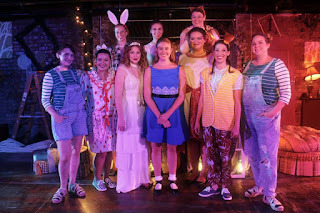 I took in an unusual doubleheader last night: an utterly charming performance of the Firehouse/TheatreLab co-pro “Alice: A New Musical” and a thoroughly dispiriting final episode in the Netflix series, “Marvel’s The Defenders.” The two were near mirror images: the former was surprising, delightful, and satisfying; the latter was predictable, dull, and disappointing. Lucky for me, the positive power of “Alice” was stronger than the suckitude of “The Defenders” so the night was a net boost to my spirits. First, to dispatch with this Marvel monstronsity: my ire is fueled largely by my fondness for the antecedents. 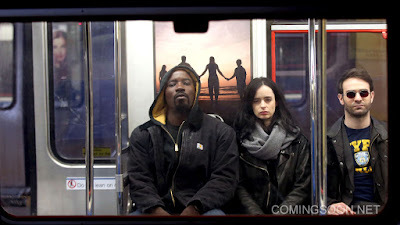 I loved Jessica Jones and Luke Cage -- both bold skews on the standard superhero dreck – and really liked most of Daredevil’s two seasons. (I’m not a completist so I left Iron Fist alone based on its critical reception.) Defenders diminished both Jones and Cage and, while it was fun to see Sigourney Weaver as the big bad, nothing was bold or imaginative about this mash-up. Secret, spooky organization with world-threatening evil plan – check; heroes thrown together uneasily into a ragtag team with much internal conflict – check; lots of nearly random fighting that made little sense and, worse, mostly has no real impact – check. And OMFG that ending. I won’t spoil anything but I will draw the comparison that it’s actually worse than the ending to “Batman v Superman,” and that’s pretty bad. So: turning to the bright side, how about that “Alice?” The show’s been selling out and extended and for damn good reason. Director Adam Ferguson has assembled a cast of stunning talent and put them to work in service of a joyful-but-not-without-angst take on the classic Wonderland adventure. There are many aspects of Ferguson’s work to laud: from a set (also by Ferguson) that makes great use of the nooks and crannies in TheatreLab’s Basement venue to the clever, thoughtful scenic transitions that never impede the action. How happy many theatergoers would be if directors paid more attention to cutting the momentum-killing time expended on scene transitions. 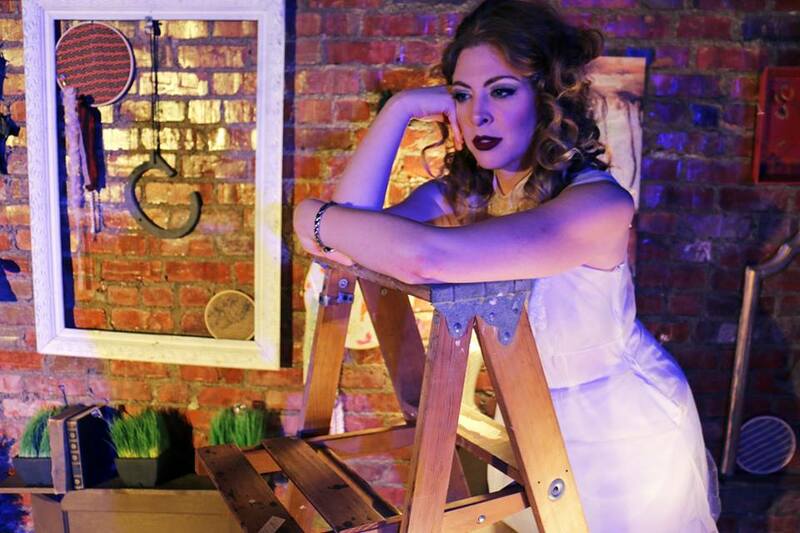 Emily Berg-Poff Dandridge as White Rabbit: Hers is the first character from “Wonderland” that wanders into Alice’s life and Dandridge provides a perfect introduction to this alternative reality. Anxious without being manic, arch without being angry, and moving with a jaunty springiness reflecting her skill as a dancer, Dandridge leads Alice down the rabbit hole in a way that certainly anyone would follow. Her renown as a choreographer has been growing, but did everyone else know she could sing and act so well, too? Clearly, Ferguson did and he made a great choice casting her. Anne Michelle Forbes as Duchess/Dormouse: With appearances in 6 significant productions in the last year or so, Ms. Forbes has become a welcome new staple on the local stage scene. Her Duchess is a deep dive into the wackadoodle mentality of Wonderland, childishly delighted one moment, dangerously enraged the next. Forbes makes these transitions as quickly and easily as donning and doffing a baseball cap, a testament to her still-burgeoning acting chops. Maggie Bavolack as Tweedle Dum/Caterpillar: There are few comedians who generate laughs as easily and deftly as Bavolack. When she appears with her entourage as the Caterpillar, the audience is giggling before she says her first line. Her crying baby elicits howls without requiring any dialogue. From what I hear, the Tweedle brothers were going to be played by men and that would have robbed Richmond of the comic stylings of Bavolack and Hindman, a team that could do a “Dumb and Dumber”-style road show that would surely surpass the Carrey/Daniels duo in hilarity. 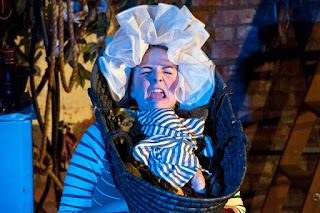 Rachel Hindman as Tweedle Dee/Mouse: A good slice of Hindman’s power onstage has to do with her extraordinary eyes – wide, far-searching eyes that infuse her seafaring mouse character with a look of nomadic fervor and just a bit of out-in-the-sun-too-long madness. 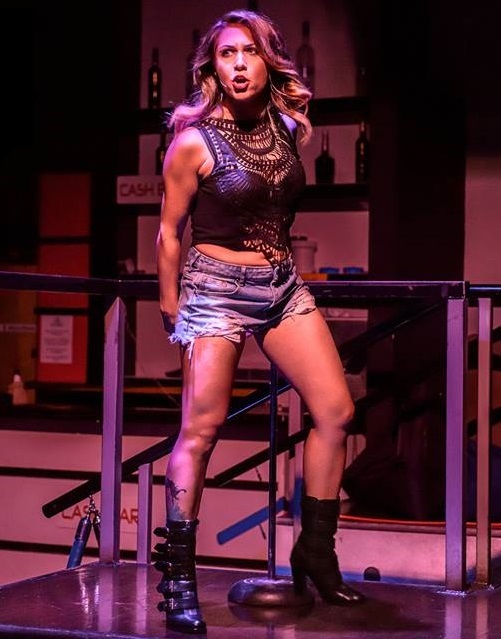 Hindman was impressive as St Jimmy in Ferguson’s American Idiot last summer and she’s no less impressive here. Mallory Keene as March Hare/Cook: Ms. Keene gets fewer chances to stand out as others in this exceptional cast but she makes good use of the times she gets. Her pepper-wielding Cook makes a fine foil for Forbes’s Duchess and she and Sneed partner for a fabulously nutty tea party. I look forward to the next chance to see her shine. Caitlin Sneed as Mad Hatter/Girl with the Cat/Chesire Cat/Dinah: I simply couldn’t take my eyes off Sneed almost every scene she was in. 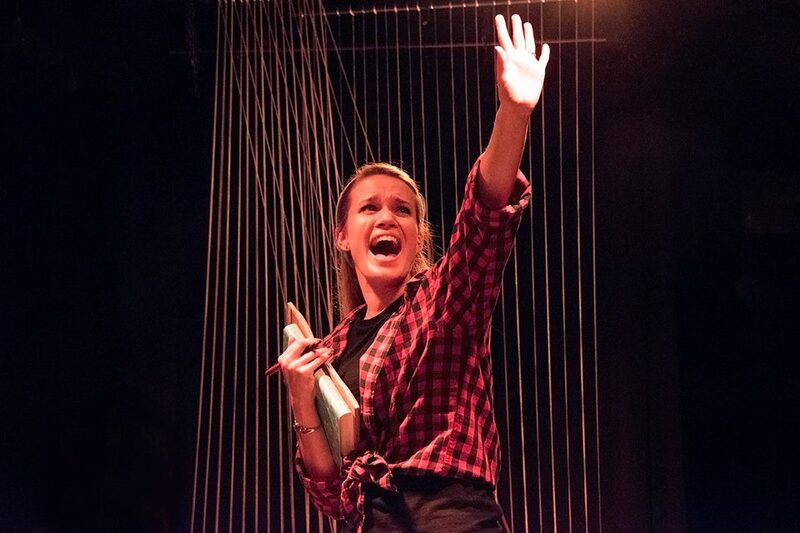 There are actors that seem effortlessly confident and self-possessed on stage – actors who never seem to be consciously “acting” – and that is certainly Sneed. Not to mention a soaring, powerhouse voice that starts the show with a clear signal that there are some capital V voices at work in this production. Rachel Dilliplane as Sister/Frog-Footman: A bit of an unsung hero in this piece, Dilliplane plays some of the more reserved characters in “Alice” but does so in a fully realized way. 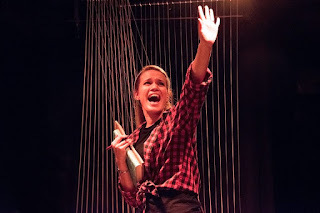 Her recurring appearance as Alice’s sister, in particular, establishes a reassuring energy that acts as a reminder that the real world that Alice may return to will welcome her back with love. Kelsey Cordrey as Mother/Queen of Hearts: In another actor’s hands, the Queen of Hearts could have been a cartoon-y villainess. But in creating a compelling Mother/Queen duelism, Cordrey makes us feel empathy, even affection, for the big bad in this story and her song to Alice at the ending is a true heart-tugger. Grey Garrett as the White Queen: At this point, I’ve run out of adequate adjectives to do justice to Garrett in this role. So much of what she does here is unspoken, her quiet curious spying on Alice’s progress, and the sweet melancholy she brings to their ultimate interactions. From the beginning, you can sense a longing for a true companion in Alice and a sadness in her knowing that their time together will be so brief. Garrett adds this to a growing list of powerful performances where she commands attention in the most unassuming way, a talent I don’t know if they teach in acting school. Rachel Marrs as Alice: It’s not easy playing an adolescent. Many actors portray them as sullen angst buckets or as bratty grown-up 2-year olds or sometimes as overly prescient empaths. Marrs captures the wonder and innocence without making Alice too childlike, and the budding intelligence and self-assertion without making her a punk. She serves as a delightful tour guide of the alternate reality Ferguson has created and a winning protagonist that this father-of-daughters was rooting for the whole time. And a hit “Heathers” has been, for good reason. 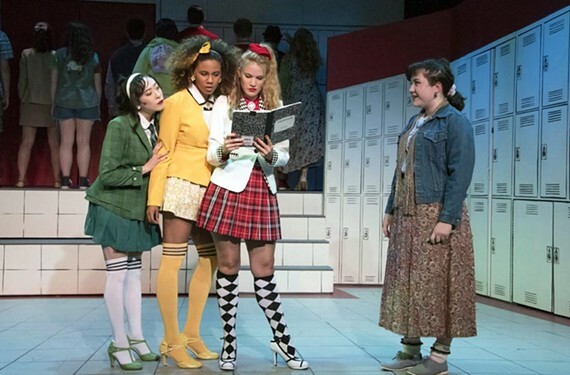 Where “The Toxic Avenger” leavened its darkness with a healthy dose of silly, “Heathers” starts with teenage angst, stirs in irony, pathos and deeply twisted humor, and then whips it all into a dark delicious mélange. Even with an inevitable dip in energy in the second act as the various threads unravel, this production is a delight throughout and director Debra Clinton shows herself to be at the pinnacle of her skills. Crack open a character and you find a person. One of this production’s many strengths is that even characters that can seem a bit one-note are played by actors who give them a fully-realized rendering when they take center stage. The most obvious of these is Leanna Hicks as Martha “Dumptruck.” Sure, she’s the superperky nerd sidekick, but then give her a song to herself (“Kindergarten Boyfriend”) and she’s a 3D person with a complex inner life. 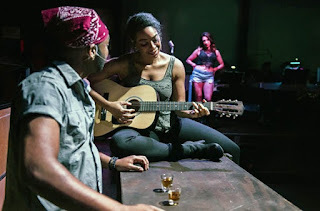 Hicks knocks it out of the park, a triumph echoed by Michaela Nicole (“Heather McNamara”) and Billy Christopher Maupin (“Ram’s Dad”) who both grab ahold of their solos and wring surprising depth of emotions out of them. If only. Carmen Wiley as Veronica has been praised plenty already and she is truly fantastic. 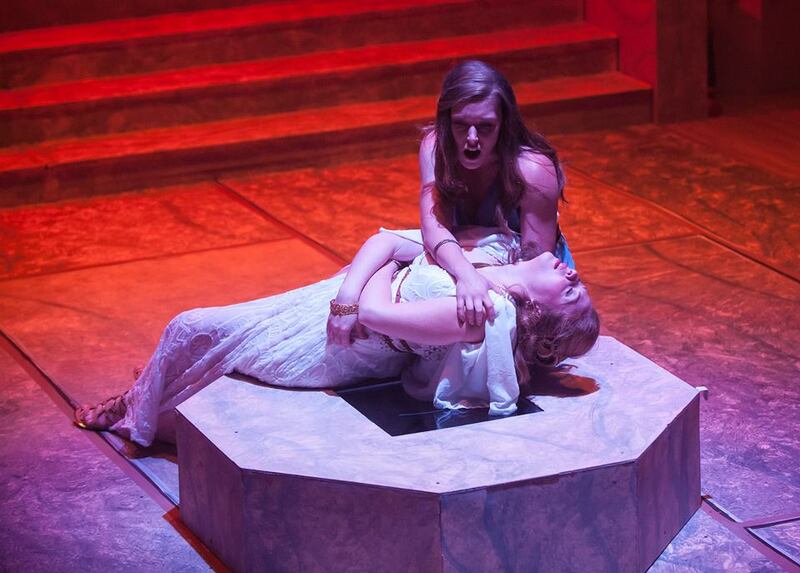 I’ll just add that this show makes me regret I didn’t make a point of seeing the Theatre VCU productions she was in. Smug-free zone. Adam Valentine as J.D. is not the strongest singer. But he harmonizes fabulously in his songs with Wiley and, though it’s been a while since I saw the movie, I liked his performance better than I remember liking the annoyingly smug Christian Slater. Music! The music may be recorded by Jason Marks’ tracks are playfully dynamic and richly produced. He and Clinton just need to keep doing more and more things together. I'm lucky to have snuck in for one of the last performances; the end of the run through the 12th is sold out. What's your damage? If you missed this show, it could be significant. At some point during every episode of Lovett or Leave It, one of my favorite political podcasts, the host Jon Lovett exclaims, “What a week!” He’s usually reacting to the turmoil in presidential politics. But you could certainly say the same for theater this past week, both local and national. 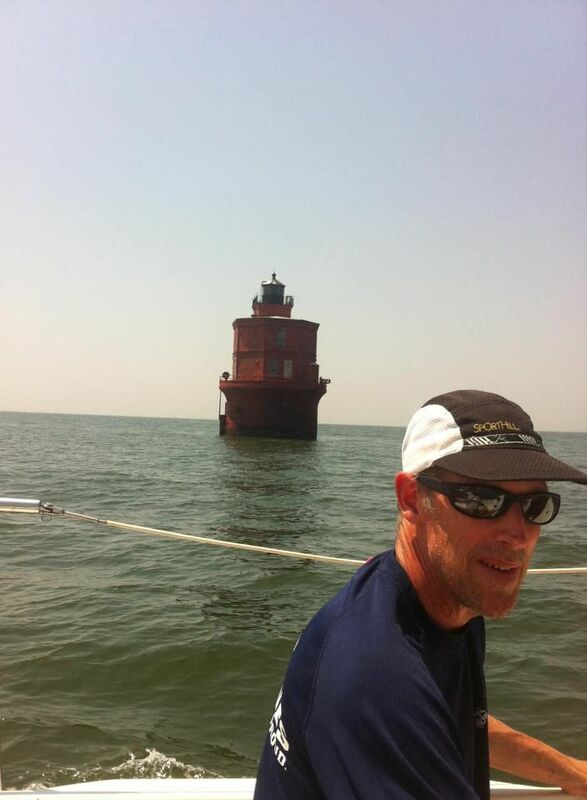 First, you have Morrie Piersol getting plucked out of the North Atlantic, a rescue so awesome it received Icelandic news coverage and even more comprehensive local coverage that got picked up on the national wire. Thank goodness Morrie is safe and thank god for the Icelandic Coast Guard and all rescuers involved for their heroic efforts. Morrie has been a great theater teacher at Appomattox Regional Governor’s School and has directed numerous acclaimed productions on local stages. We’re hopeful he’ll stay safe on solid ground for at least the next little while. Then you have all of these shows opening or closing or both. SPARC’s “Oliver!” opened and closed and by all accounts was awesome. “Thoroughly Modern Millie” opened at the Dell and people have one more weekend to rush out and see it. And “In the Heights” (Virginia Rep) and “Macbeth” (Quill) both closed after sterling runs at their respective venues. You’d think we’d have a minute to breath before there were new shows to rush out and see but, NO, before you know it “The View Upstairs” is going to be opening at RTP and “Alice: A New Musical” will debut at Firehouse (in a co-production with TheatreLAB as part of their season of collaboration). It’s the summer, people – don’t you understand that things are supposed to be low-key and calm?!?! We were all saddened by the passing of Sam Shepard – what the heck with all these iconic creative people dying lately? Shepard was a Virginia resident for about a decade and wrote some amazing, devastating plays. 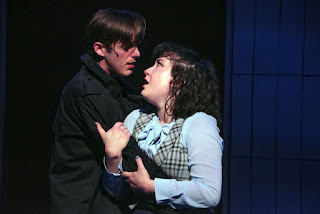 Productions of Shepard’s work in Richmond have been stunning and mesmerizing, starring some of our town’s best talent. Does anyone else remember Stephanie Kelley in “Buried Child?” She was exquisite. 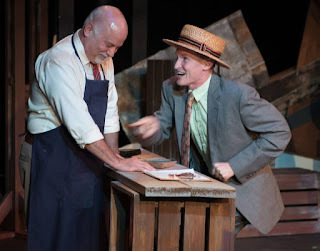 More recent productions of “True West” (Toney Foley! David Clark!) and “A Lie of the Mind” (McLean Jesse, Alex Sapp, too many to mention…) have also been exceptional. 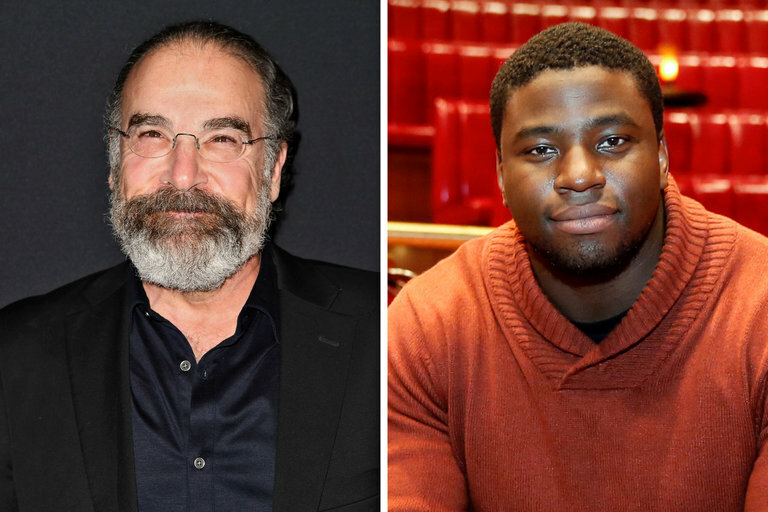 It’s sad to think of such a distinctive voice in American theater no longer making art. 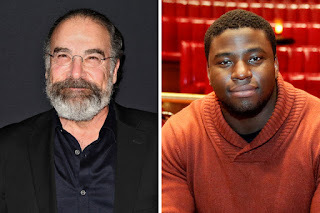 Then we were all confused – ok, maybe just me – by the dust up related to “Natasha, Pierre & the Great Comet of 1812” and the casting of Mandy Patinkin. The clash of Broadway financial concerns and racial optics seemed to guarantee that someone would be pissed off by something. There are a dozen or so OpEds embedded in this situation, but I don't have the time to write one just now. 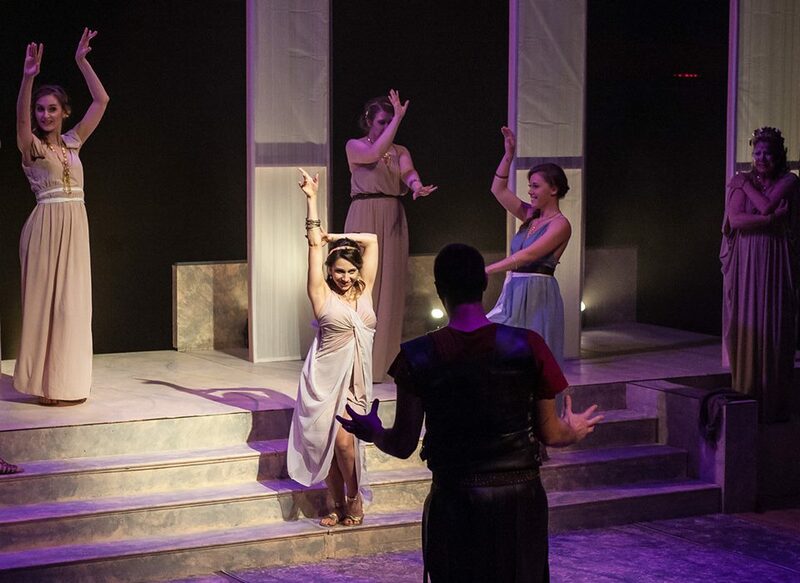 Richmond Shakespeare is off and running in 2013! What has turned into my Diary. Edited. Promotional Video for As You Like It !!!! Day: No clue. A reason to return.